Many outsourcing IT Providers tend to stipulate in their service agreements what is included and what is not in their service offering. Outsourcing Companies specialize in Remote Tech Support in India tend to also try to juggle many clients on as small a workforce as possible. We here believe that the best approach is to tailor each one of our service agreements to that particular companies needs. In that first meeting with a member of the Outsourcing IT Help Desk Support services Center that you are contemplating outsourcing your Teir1/2 HelpDesk Support too, you should take into consideration what are the questions asked of you by the management of that IT Outsourcing center. How long does it take for them to discuss pricing with you? How does the Outsourcing Center’s management respond to suggestions to make some customization to their system to accommodate you are some of your specific needs? It’s very important to gauge in that initial meeting the general interaction skills of management as it will give you a fair idea of what to expect when dealing with their staff that in turn will have to work with your clients. 1. How many agents “computers” or users do you currently support as an IT Service Provider 2. What is the highest SLA Response time your clients expect from you or that you have agreed to provide 3. How many tickets are closed on average over the last three months by your current IT HelpDesk 4. How many of those tickets are deemed change management “password and creation tasks” Teir1 Tickets 5. Do your clients submit their requests via phone, email or chat? It is certainly a reasonable request in my opinion to request from the offshore Outsourced IT Helpdesk you are interested in forming a business relationship with for a few references of current or recent clients. This ensures you form an opinion with enough relevant feedback of their operations. 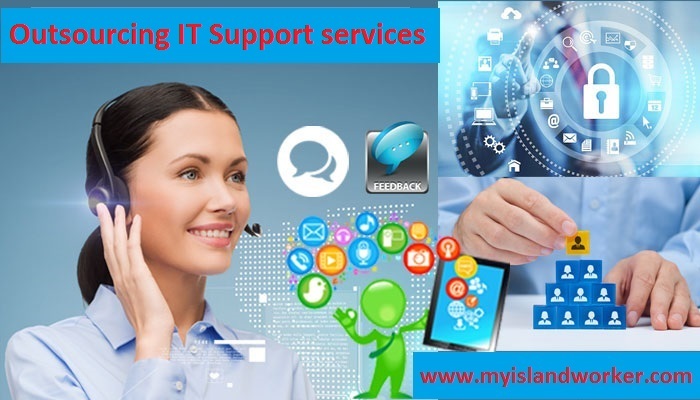 Here at Myislandworker we ensure that each client is assigned a Technical Representative that will be either assigned full time to that IT Service Provider “depending on the service plan” or on a ticket by ticket basis. This ensures the IT Manged Service Provider and the particular technical Representative can start building a professional relationship and also the clients of the IT Service Company will become familiar with one individual.